I spent some of my time today building a calculator. I still know how to handle a soldering iron, but this time around, the design is not of my own. 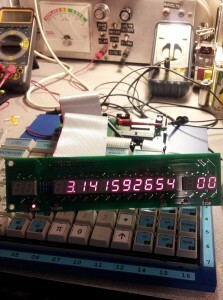 The credit goes to Michael Berger, a calculator enthusiast in Germany who decided to resurrect a classic East German desktop calculator, the Robotron K-1003 in the form of a microcontroller-based kit. And thanks to Michael, I had some pre-Christmas fun. But now that the calculator is up and running, I feel compelled to find its original German-language manuals and understand its programming model.